Global Finance brings together some of the top minds in treasury and cash management to discuss risk management, technology, regulation and the future of cash management. Global Finance: We seem to be in a global economic environment in which minimal near-term growth is expected from OECD countries. However, emerging markets are expected to continue to grow. What are the implications of this for corporates and banks? How will each adapt, and how will that affect their treasury and cash management functions? Rohan Ryan, senior vice president, Bank of America Merrill Lynch: As corporates focus on emerging markets to diversify revenue as well as to enhance revenue streams, they have to decide how they plan to expand globally in terms of treasury decision-making. They can choose either to centralize their decision-making or to push decision-making authority out to the regions. Banks obviously recognize that corporates are going into emerging markets, so they want to provide treasury services to corporates in emerging markets. Broadly, banks will employ two types of models: a retail model that will suggest that they're going to be everywhere; or the banker's bank model, where they won't be everywhere, but they're going to strategically pick partners to provide best-in-class reach and service from a treasury services perspective. In his capacity as head of global payments, Dado has full accountability for global payment services and global cash management. Prior to taking this position, Dado was the head of global transaction services (GTS) Netherlands, where he was able to build upon his extensive expertise and knowledge gained from 20 years in transactional banking—including cash management, electronic banking, relationship banking and product management. Wilco Dado, head of global payments, global transaction services, RBS: We are seeing an increasing trend in companies extending efforts to further release or drive benefit from cash balances that would otherwise lie unused in overseas accounts—whether through advanced liquidity structures or flexible investment options that they can employ to make efficient use of the freed-up surplus cash. Amol Gupte, managing director, global transaction services, Citi: There will be disproportionate growth in the emerging markets compared with developed markets for quite a few years to come, so we're trying to help our emerging market local corporates grow. As they grow, they will expand into other markets. As they do that, and as they acquire assets, they start needing treasury and trade services, and their needs become complex. They're managing assets in geographies they're not familiar with. First, they need trade and liquidity tools to manage the assets they've bought, or the geography they're trying to conquer. Then we can help them raise capital in other markets, make payroll, rent and supplier payments, and/or collect their receivables. The second wave of growth under way is the huge growth in the middle class in the emerging markets, which will lead to a huge spending and credit growth. For banks, that presents a huge opportunity, not directly in the treasury space but in consumer lending, finance and banking. Dennis Sweeney, deputy treasurer, GE: As multinationals go after growth in an emerging market, one of the problems we have is liquidity. You may need to raise money there, or there may be restrictions on moving money across borders. If you are successful and you are making profits, getting them out may be the challenge, so there's a lot to be developed, hopefully with our banking friends, to provide in emerging markets the more sophisticated products and services that you offer in Western Europe and in the US. In response to your being bankers' banks, I see that a lot. A lot of the banks are coming to me saying not that they can do everything I need, but that they've got the right partners set up. Banks are looking very hard at how to take their technology and link up to a local partner. As a multinational, I can tie into your technology—I'm probably already tied in—so this is a healthy development from a multinational point of view. Dado: When multinationals no longer use just one bank in one region, is that not a risk management issue—you don't want to put all your eggs in one basket? Sweeney: You have two forces at work there. One is you don't get all your credit from the one bank. And the other is you don't want to put all your risk in one bag. Ryan: When you look at which model is better—the bankers' bank model versus the full retail model—it depends on the type of business. For some, having the bricks-and-mortar in every single country is appealing. However, B-to-B clients would probably prefer a choice between the two models—it depends on the size of their organization as well as their international expansion goals and lots of other factors. As head of treasury & trade solutions for Citi's Global Transaction Services business in North America Amol Gupte is responsible for oversight of all cash and trade products across North America, including receivables, liquidity & investments, commercial cards, payments, information services and trade finance and trade services. Under his leadership, Citi has established itself as the premier provider of treasury and trade solutions across North America, with leadership positions awarded by key industry publications and top-rated rankings voted by Citi's clients across the region. Prior to assuming his current role, Gupte managed Citi's payments business in Europe, the Middle East and North Africa (EMEA). Throughout his two-decade career at Citi, Gupte has served the organization in a variety of capacities with leadership roles across product management, relationship management and treasury. His diverse experience includes positions in Citi's consumer banking, corporate banking and investment banking businesses in EMEA, Asia and North America. Gupte received his MBA from Bombay University. Gupte: We're present in nearly 100 countries, and we see ourselves being very well positioned for the next five to 10 years because we are in the middle of where the growth is going to be. When you look at the whole spectrum of demand for banking services, there's a lot between being a retail bank on the one hand and being a banker's bank on the other. There are many markets where we are not a retail bank, but we have a deep presence in the corporate space, and being able to connect what we do for our corporates directly rather than through another bank, seamlessly is extremely meaningfully and important to our clients. Globality is much more than a branch presence or the ability to clear and settle transactions in a particular currency via another bank—it is having a people network that matches with our clients' network, having cross-currency capabilities and having truly global product and service platforms. GF: Recent months have seen a flood of new financial and bank laws and regulations. Which of these have the greatest impact on corporates and treasury and cash management functions? Ryan: The repeal of Regulation Q—a US regulation that basically prohibits banks from paying interest in DDAs (demand deposit accounts)—will change the way certain customers receive earnings on their deposits, as banks will be permitted, starting in July 2011, to pay interest on DDAs. From a banking perspective, some would argue that the repeal of the regulation would increase the liability that banks have with respect to interest owed on deposits. It raises the key question of what will happen to earnings credit, for example, which is a very popular way of reducing treasury management fees. How is that going to be deployed in a post-Regulation Q environment? Other key questions revolve around Basel III, which is going to have potentially a huge impact on transaction services going forward, increasing the cost of funding for banks. Dado: The new capital rules will also have a specific impact on the trade finance business. Trade finance products such as letters of credit are included with off-balance-sheet instruments and given an increased credit conversion factor of 100% for the purposes of calculating the leverage ratio. It will increase the costs tremendously for banks. Basel III will drive greater linkages between working capital investing and the operating business. Banks will be placing a higher value on operating account balances. As a result, banks are rolling out more advanced account-based investment solutions. But there's no doubt which of the regulatory changes has the greatest impact, both for banks and corporates: It's Basel III. GF: According to Global Finance research, 60% of the corporates feel a 5% increase in banking fees is a fair price for improved financial stability. Dado: I'm not sure 5% is enough—and what people say in a survey might not be what they would do in practice. Gupte: I agree with the above comments—and that the repeal of Reg Q and Basel III are the main pieces that impact cash and treasury management. Another one that will have an impact is the fact that for another two years the FDIC will provide insurance for non-interest-bearing balances. Combine that with the Reg Q repeal and you don't need to sweep balances offshore and the whole composition of balances could change. Plus the fact that you've got insurance may encourage corporates to behave differently—we might see more money actually flowing into the US because you've got insurance. Finally, for Basel III different banks will start from different points to meet a prescribed structural liquidity ratio. Accordingly, you'll see some irrational pricing behavior from a bank that's far away from where it needs to be versus a bank that's not far away. Banks might out-price other banks or up-price other banks to get to the prescribed structural liquidity ratios. Dennis Sweeney has been with GE since 1992. As deputy treasurer, he is currently responsible for global cash management. He and his team operate from their base in Stamford, Connecticut, and through regional treasury centers in Dublin, Delhi, Shanghai, Tokyo and São Paulo. Sweeney is a highly regarded innovator in the field of treasury services. He has been a leading proponent of improving communications between corporations and their banks to drive productivity and reduce costs. Earlier this decade, GE and its software vendor co- developed the first Web-enabled treasury workstation. Sweeney later pioneered corporate access to the SWIFT network and has led GE to be the largest corporate user of SWIFT services. He is also the driving force behind the TWIST BSB standard for electronically invoicing international bank service fees. Sweeney is now looking to integrate GE's solution into the SWIFT Enquiries and Investigations message set and has put GE's weight behind the nascent e-BAM effort to digitize bank account administration. Most recently, he has spearheaded efforts to eliminate paper monthly statements and replace them with e-statements delivered in bulk files via SWIFT FileAct. Prior to joining GE, Dennis spent 13 years at PepsiCo. He holds a BS degree in accounting from the Binghamton University and an MBA in finance from Fordham University in New York. Sweeney: If we're required to hold more capital, clearly that's a cost for all of us, including financial services companies. It's going to be interesting if you start paying the interest, but you want funding that is longer-term for Basel III, but I want to hold shorter-term investments for my liquidity model. As all this shakes out and settles down there may be imbalances temporarily. At the same time, credit exposure is not going to go away and we're still going to be worried if we're offering the best rate. The pure interest, whether it's paid to you in an earnings credit rate or an interest charge, is irrelevant. Corporates know that game. But what you're going to see is, I want liquidity, you want stability. How do we meet in the middle and come up with a price solution? GF: Are you concerned about changes in how derivatives are treated and the impact that might have on corporates? Sweeney: Yes, for corporate treasuries this could be an added cost. We're not used to having the systems and people in place to be managing collateral settlement on an exchange on a daily basis. It's going to be an increase in our costs just to do the same business that we were doing. Typically corporate treasuries don't have software for monitoring the positions and answering calls from the exchange for collateral and so on. 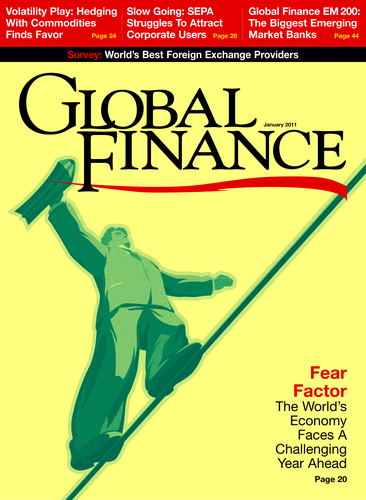 GF: The recent financial crisis has heightened managers' concern at every level to risk management. How is this playing out in treasury and cash management? Sweeney: Not a day goes by I don't get a call from my risk manager saying such and such bank is over its limit. We are monitoring as best we can all of our exposures to a given bank. Everybody's exposure management processes were beefed up. This is not only raising the cost of treasury management, it also drives some decisions. I may want to do more transaction banking with you, but for a variety of reasons I'm already maxed out on my exposure, so someone else is going to get that business. You really have to look a matrix of who can I take more exposure with, and are they operating in a country I need, and do they offer the services? Gupte: In the past two years we've seen treasurers getting more and more involved in breaking the silos across their own organizations because when they start looking at enterprise risk, and they look to respond to issues on risk, oftentimes it is beyond just the treasury that they manage. It goes back into the supply chain management process, into the procurement process. Ryan: Clients are focusing more on investment guidelines and cash forecasting. Most large organizations had investment guidelines prior to 2008. However, those guidelines were very explicit in terms of the risk they were willing to take in noncash asset classes, while language specific to cash was sometimes regarded as vague. However, post-2008 we continue to see increased rigor around understanding exposure and maintaining risk transparency in the cash-equivalent space. Dado: I would add that clients are diversifying to different types of products—such as supply chain finance or trade finance—in order to reduce risk. Clients are also more interested in using bank-agnostic channels. Corporates can manage transactions, investments and FX across multiple bank relationships without sacrificing existing operational efficiencies and standardization. GF: What is the status of SEPA? Banks seem to be ready to move ahead, but there seems to be no urgency from corporates. Why is this? What if anything will make the situation change? Gupte: Much was made about SEPA, and much was made on the run-up about being ready. Now, everyone's ready, but still there's not a lot of critical mass in terms of volume. The concentration of volume in domestic European country infrastructure is so large that there is really no incentive for them to migrate into SEPA. And SEPA also had inadequacies, in that it didn't really cater to every little twist in each market. They have built many of those out now, but there still isn't enough commercial motivation or benefit to switch volumes into the new infrastructure. To increase adoption, it would need a top-down regulatory push, which is now being spoken about with an end date in 2012. For corporates, SEPA is a huge potential benefit that's not being realized in Europe. We're all keen and eager that it does actually migrate into one infrastructure that everyone can take advantage of. Dado: I believe the benefits for businesses are limited. Less than one-and-a-half percent of all the transactions in the SEPA area are cross-border. And although there is no doubt that SEPA will enable corporates and financial institutions alike to rationalize the number of accounts they hold, a single SEPA account remains a challenge for a number of reasons—including tax, local regulation and reporting, ERP integration, standardization of formats, mandate management migration from local to SEPA scheme, etc. Sweeney: I'm surprised at this perception that there's no commercial advantage. GE has businesses that operate cross-border that would benefit. There are obstacles, though. In some countries, if you want to do direct debits and use SEPA, you have to get a new mandate. That is an unbelievable burden, to go out to thousands of customers and get new mandates to direct-debit them, and it's certainly holding back corporates because using direct debits for collections is a big advantage to a corporate. Payments are already centralized for most corporates, but it's much easier to centralize your payments out of one euro account. On the banking side, taking out all this infrastructure that you have to maintain to be able to transform my single payment file into 10 different formats and have real-time connectivity with 10 different clearing houses, surely must provide a commercial incentive for the banks. As head of treasury liquidity solutions for global corporate banking, Americas, Rohan Ryan is responsible for leading liquidity specialists who aim to provide solutions to multinational corporations looking to optimize cash balances in the Americas and abroad. In addition, Ryan has liquidity product management responsibility in Canada and Latin America. Ryan joined Bank of America Merrill Lynch in 2010 and has over 15 years’ experience providing liquidity solutions to various corporate customers. Prior to joining the bank, Ryan spent more than a decade with JPMorgan Chase, where he held various leadership roles in cash management, trust and custody services. Before that, Ryan was responsible for leading a team of investment consultants within Bank of New York’s stock transfer division. Ryan holds an MBA from Rutgers University and a BS in business management from Fordham University. Ryan: What's holding back some corporates is the conversion risk associated with leaving a legacy platform and converting to SEPA. GF: What are corporates and their banking partners doing to ensure adequate working capital? What's different these days than several years ago? Gupte: Post-crisis, corporates became far more focused on squeezing out as much internal working capital as they could in managing their cash conversion cycle, reducing their DSOs, extending their DPOs and reducing inventories. Banks have played a large role in helping at least two of those three variables that impact the cash conversion cycle—DSO and DPO—through supply chain finance solutions. Other than optimizing their own working capital needs, they have also managed to improve financing options for both their suppliers and distributors and clients in this difficult economic period. Ryan: Corporations obviously realized that forecasting and having adequate liquidity to meet their daily working capital needs is paramount. We've seen tremendous growth in terms of cash and cash equivalents being held by corporates. At some point there's going to be a force that pushes corporates to reallocate cash into other asset classes—they're going to have to tussle between risk management and the need or the desire to outperform their peers. Sweeney: Knowing where your cash is and being able to forecast your cash has changed dramatically since the crisis. It's not just what are you going to spend today, but how does what you're spending today fit into the forecast for the next quarter, into year-end, and so forth? Merging that short-term tactical forecast with longer-term business goals has gotten a lot more attention. Now it's front and center, where it should be. GF: Corporates seem to be positive about direct contact with SWIFT. What are the latest developments in this area? Dado: What's happening is quite remarkable. Until a couple of years ago, banks were reluctant to allow corporates direct access to SWIFT. Now the banks are actually working closely together to develop more bank-agnostic services for SWIFT, which could be a benefit to the corporates. Another development is multibank EBAM—electronic bank account management—solutions that will enable companies to better manage their accounts in an electronic way. Another development under way is standardized security. GF: Why did banks change radically toward direct contact by corporates? Dado: Maintaining the channels is quite expensive, so if somebody else can do it, it's fine. Also, our clients don't bank with one bank, so it makes sense for them to have access to SWIFT. Sweeney: We now have approximately 80 banks that we're connected to through SWIFT. Trying to maintain an electronic data interchange (EDI) connection with that many banks around the world would be a nightmare, so SWIFT offers a real value to corporates because you've got one pipe that you're communicating over, one security protocol, one set of formats. That's a good value proposition. GF: Tell us about GE's history with SWIFT. Sweeney: We were one of the big proponents of corporate access to SWIFT. We use it for balance reporting and funds transfers around the world and we're looking to use SWIFT to do more things. We're pushing to get month-end official bank statements in PDF format so that I can store it and make it available to my businesses, rather than having to go to your portal and download it one account at a time. We're interested in E&I; (exceptions and investigations). We have an internal system that creates queries where our business units are asking us questions about a bank transaction and I want to be able to send that to the bank via an E&I; message so they can process it straight through into their back-office system. When you look at EBAM, at E&I;, at e-statements, it's all about getting productivity in my back office. That cements the relationship with my leading banks because it's not about, can I get a check processed for half a cent cheaper? It's all about automation and productivity. Dado: Previously, banks were afraid that they would lose the direct link with the client if the client weren't using the bank's own proprietary channel. Now, more and more banks are working together on certain developments that are not in the competitive sphere. Also, a bank cannot give all the service to their clients in every market, so they have to work together. Gupte: I agree with both my colleagues' points, but while most of our clients who use SWIFT are very happy with their experience, some still struggle with the return on investment. As you add functionality through EBAM and E&I; and statements, you're leveraging more from your fixed expense, so it's going to become more and more worthwhile. For the smaller corporates it might not turn out as well as they thought because some of the fixed costs are not exactly small. Sweeney: There are two other important developments with SWIFT. SWIFT has developed a standard for electronic invoices, which has a lot of potential to standardize what is a very fragmented market right now, and maybe to get banks in as service providers. The other, which is really important, is the identity manager. EBAM as an application is finally going to cause people to adopt digital identities. If we could get a critical mass on digital identity, it opens up all kinds of possibilities for services and products. GF: Short-term interest rates are low and deposit levels are high. When can we expect a change in either of these, and how should corporates prepare? Ryan: Eventually, interest rates will rise. As corporates look across not only their short-term cash but longer-term cash, they have to be mindful of some of the products that would be well positioned in a rising-interest-rate environment. Working with their banking providers will help increase understanding of how different products relative to different rate cycles can be beneficial to earnings. The objective is to ensure that when the rate cycle eventually changes, they're well educated in terms of how to manage risk-return going forward. Sweeney: The reason we're holding more cash is to keep our business safe and secure. We will continue to manage cash to be sure we are protected from liquidity stresses. Gupte: It's difficult to say when rates will go up, especially with the announcement of QE2. We're in period where it's very difficult to know with any degree of precision when we'll see any uptick. GF: What new financial products or existing products in new regions are transaction processing banks working on? Dado: Replication of liquidity cash optimization solutions from more mature markets like the US to emerging markets, just-in-time funding—so you have less usage of working capital—more use of bank-agnostic channels and more active price management. There are also more competitors coming in, though, so it's not just transaction processing banks, but also payment service providers that are creating new products. One of the biggest challenges transaction banks face is in low-value payments. I would guess that in five to 10 years' time very few banks, if any, will be in that area anymore. It will be all handled by the likes of PayPal. Gupte: In the B2C and the C2B space there's explosive growth on the back of technology and in the way small businesses and individuals are spending money. We are working on getting our consumer, card and treasury businesses to work together through the creation of a new business unit 'Enterprise-Wide Payments' to harness this opportunity. Ryan: You'll start to see more banking institutions make investments in global platforms, ensuring that those platforms have connectivity from country to country, region to region, providing similar products, services, reporting capabilities and so on. Probably every bank has some work to do in that area. Gupte: We see a lot of potential growth for banks in prepaid cards for business/institutional applications. We also expect to see shared service centers move from handling only accounts payable to other core treasury activities. In the next five or 10 years, there'll be increasing receivables standardization, which will enable shared service centers to manage receivables rather than settling and managing them locally in each country. Sweeney: There's huge potential for corporates to streamline and take costs out, but a key to that is the ISO 2022 standard because of the richer content it enables. Unfortunately, that standard's only being halfheartedly adopted.